In the obsessive spirit of Neufert’s Architect’s Data, this research project is a practical guide to the nuts and bolts of everyday leisure: the ABC to how society spends its ‘free time’. There are more ways of having fun than we can count; Absolute Leisure catalogues some of the limitless possibilities, from music on a crowded commutes to online socializing or that long, leisurely shower. Each leisure item is illustrated with axonometric CAD drawings and current user data used to calculate global consumption of it in terms of space, time and money. This sober approach seeks to answer some simple, but pressing, questions: How big is leisure? And how costly? Will future cities be founded on pure fun? Or are we already so absolutely immersed in leisure that we don’t notice it? When did you last take a break from constant fun? Commuting. Flexiworking. Networking. Working out. As we cultivate leisure in every bit of daily life, our little pleasures add up to fuel a vast economy founded on ‘free time’. We’ve become a society of leisure aficionados, devoted to our own entertainment 24 hours a day, 365.24 days a year. 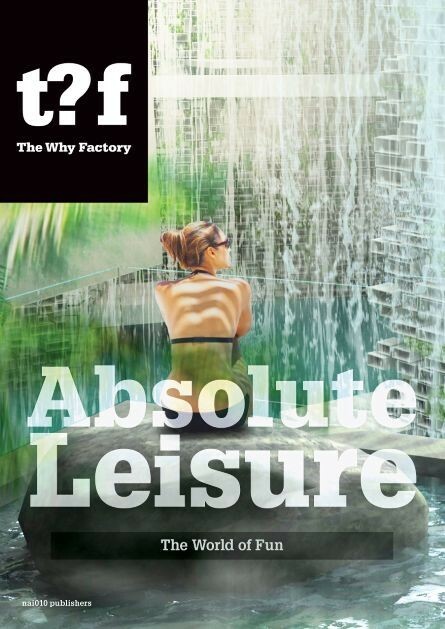 Absolute Leisure catalogues the extent to which leisure is designed into the most prosaic of items, sizing up the infrastructure of everyday leisure with Neufertian precision in terms of space, time and money. Can’t imagine a life built entirely on leisure? Dive in: This user’s manual could transform your world. Absolute Leisure is the ninth book in The Why Factory’s Future Cities Series, and follows The Why Factor(y), Visionary Cities, Green Dream, Vertical Village, Hong Kong Fantasies, City Shocks, We Want World Wonders and Barba.